These parameters are valid for the recent times, they are not directly applicable to the ancient times. This graph gives the radiative assessment over one year in 106Jm2. He shows an excess of energy in the southern hemisphere. This holds the fact that the southern summer solstice (our winter) coincides with the périhélie. This plan is in the plan of the ecliptic. In the winter solstice, it is the south pole which clocks towards the sun. In the summer solstice it is the north pole which clocks towards the sun. We draw the line of the solstices. She passes by the sun which is in one of the homes of the ellipse. 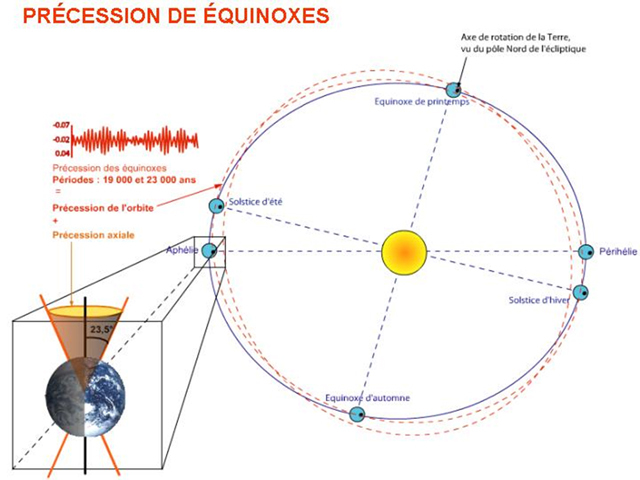 We can draw the line of the equinoxes which is perpendicular in the line of the solstices. 4 quadrants represent the seasons. 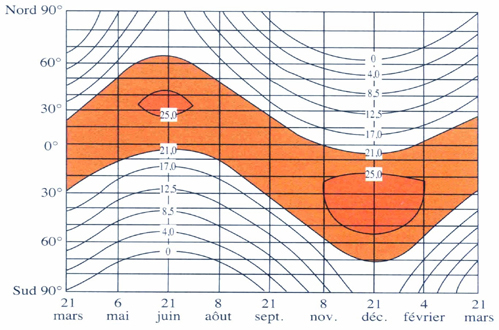 The direction of the line of the solstices does not correspond to the main line of the ellipse (line aphélie - périhélie). We notice that the duration of the seasons is not equal (law of Kepler: the angular speed is stronger in the neighborhood of the périhélie). In particular, the autumns and the winters are shorter (approximately 89 days and knowing that 365 / 4=91,25. 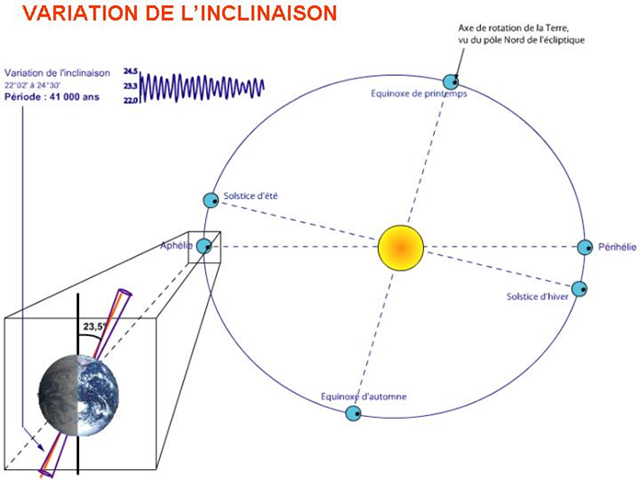 The winter solstice corresponds approximately to the périhélie, the irradiation is maximal (351 W / m2). When the eccentricity is maximal, outstrip earth - sun is most variable during the year - in summer / winter contrasted. Thus the eccentricity plays on warm contrast / annual cold. The eccentricity plays on the duration of the seasons. The obliquité or the slope is the angle which trains the axis of the poles with the normal for the plan of the ecliptic. The obliquité explains the seasons. Other one of 54 000 years (which finds itself little in the climatic archives). We have two extreme configurations for which in the neighborhood of the poles and in the summer solstice, the variation of energy is 14 %. When the slope of the axis of the Earth is maximal, the beams of the sun have difficulty in reaching the high latitudes in winter and conversely in summer summers are warm and the rigorous winters. This corresponds to the interglacial climates with few ices in the high latitudes on continents. Conversely, a decrease of slope corresponds to less warm summers and to less cold winters, configuration which however allows the development of the continental icecaps. 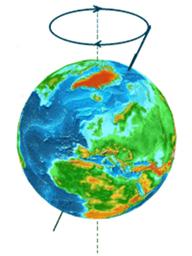 The rotation of 360 ° in the direct sense of the main line of the orbit of the earth (movement of hula - hup). 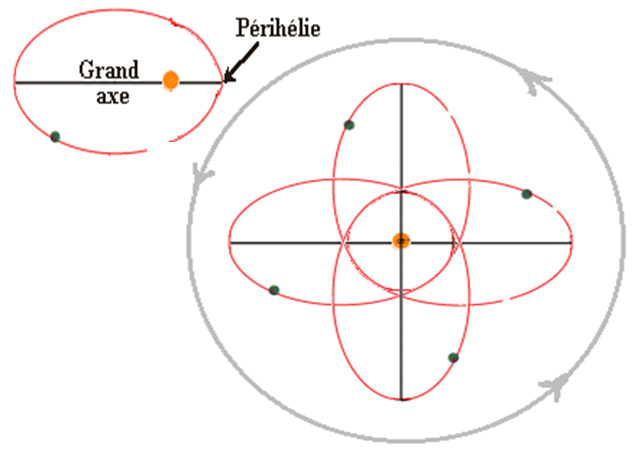 The conical rotation of the axis of the earth in the reactionary sense (period of 26 000 years). 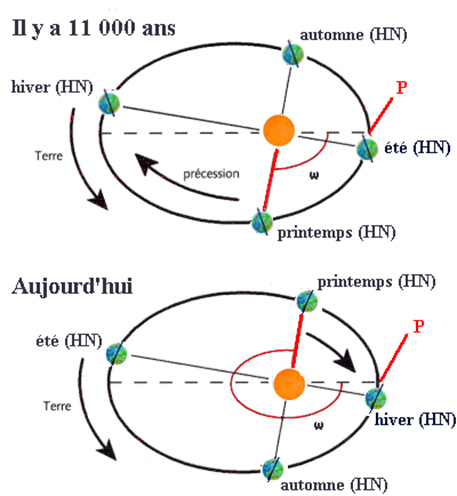 Hula - hup: with regard to stars, main line of the ellipse make a rotation in 135 000 years. 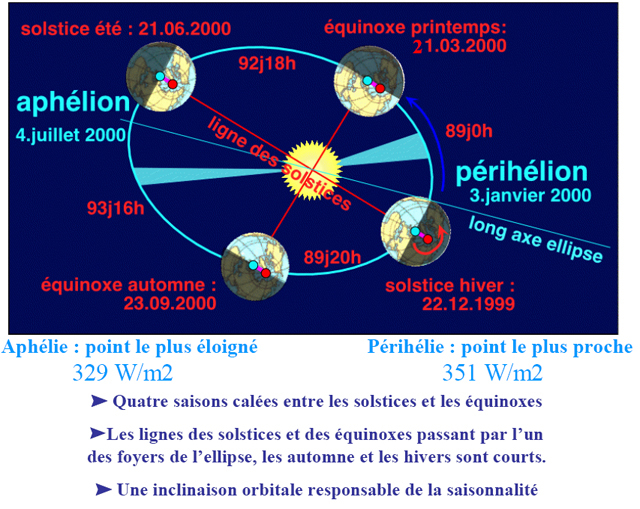 This phenomenon modifies the month of the year in which the earth is in the périhélie. 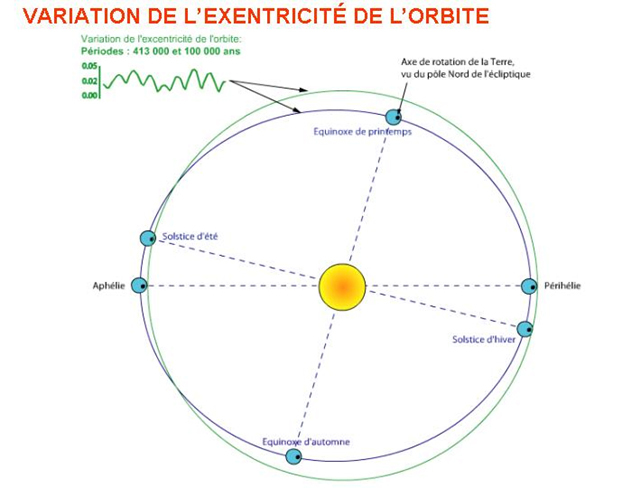 The périhélie corresponds at the time of the year when the earth is closest to the sun. The shape ellipsoïdale of the Earth (due to his rotation on herself and to the centrifugal force which creates an equatorial roll) makes that this one oscillates as a spinning top. 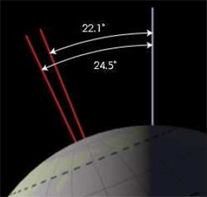 His axis of rotation, which points at present towards the pole star, describes a cone around the perpendicular direction in the plan of the ecliptic. This movement, called axial precession, is very slow because the axis resumes the same position every 26 000 years. (Attention, this is independent from the obliquité which concerns only the value of the angle and not the direction of the axis in the space). However because of the simultaneous rotation of the main line of the ellipse, the position of the Earth on the ecliptic in every season is not strictly the same every 26 000 years. The climatic precession = hulla - hup + axial precession. The combination of both movements returns the periodicity in 21 500 years. The combination of these two phenomena allows to define the climatic precession. She is defined by the angle between the périhélie and the spring equinox. So, at a moment of the year, for example in the spring equinox, the Earth is not still in the same point of its orbit and its distance to the Sun vary. 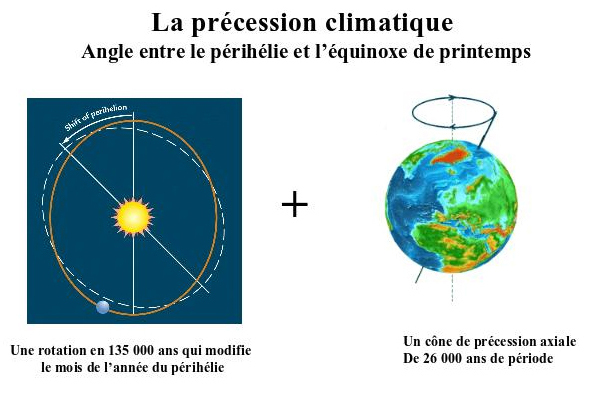 11 000 years ago, in the summer solstice (for the north hemisphere), the Earth was almost in the périhélie. The winters were colder but the warmer summers. This situation favored the disappearance of the big inlandsis built during the last glaciation. Today, the summer solstice intervenes in the part of the orbital ellipse the most remote from the Sun, summers are more spawns and the winters softer. This situation favors the growth of inlandsis.